The advantages of associating shade trees in coffee agroforestry systems (AFS) are generally thought to be restricted mostly to poor soil and sub-optimal ecological conditions for coffee cultivation whereas their role in optimal conditions remains controversial. 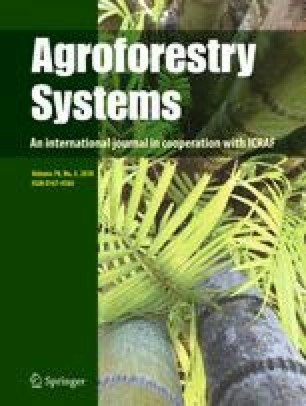 Thus, the objective of this study was to investigate, under the optimal coffee cultivation conditions of the Central Valley of Costa Rica, the impact of Inga densiflora, a very common shade tree in Central America, on the microclimate, yield and vegetative development of shaded coffee in comparison to coffee monoculture (MC). Maximum temperature of shaded coffee leaves was reduced by up to 5°C relative to coffee leaf temperature in MC. The minimum air temperature at night was 0.5°C higher in AFS than air temperature in MC demonstrating the buffering effects of shade trees. As judged by the lower relative extractable water (REW) in the deep soil layers during the dry season, water use in AFS was higher than in MC. Nevertheless, competition for water between coffee and associated trees was assumed to be limited as REW in the 0–150 cm soil layer was always higher than 0.3 in shaded coffee compared to 0.4 in monoculture. Coffee production was quite similar in both systems during the establishment of shade trees, however a yield decrease of 30% was observed in AFS compared to MC with a decrease in radiation transmittance to less than 40% during the latter years in the absence of an adequate shade tree pruning. As a result of the high contribution (60%) of shade trees to overall biomass, permanent aerial biomass accumulation in AFS amounted to two times the biomass accumulated in MC after 7 years. Thus provided an adequate pruning, Inga-shaded plantations appeared more advantageous than MC in optimal conditions, especially considering the fact that coffee AFS provides high quality coffee, farmers’ revenue diversification and environmental benefits. The authors would like to thank the Coffee Institute of Costa Rica for facilitating the use and maintenance of the experimental plot on the research station of San Pedro de Barva and the European Commission (ICA-4-CT-2001-10071) for their financial support of the scientific equipment and field measurements performed within the framework of the CASCA project (Coffee Agroforestry in Central America).